Min. quantity with your imprint is 25. Quantity variation +/- 5% is possible & billable. 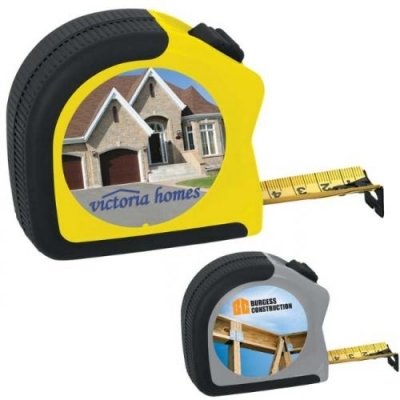 This heavy duty measuring tape has a handy belt clip on back. Rubber grip. Metric/Inch Scale Only, with 25' x 1" metal blade and belt clip. The first foot is marked in 32nds of an inch, then 16ths of an inch after that. The metric scale, marked in millimeters, is at the bottom edge. It has a push button locking mechanism for your convenience. Imprint area: 2-1/16" diameter on vinyl panel. Packaging: Gift Box. Weight: 25 lbs. per 28 pcs. Price includes up to a 4-color imprint, 1 location.